Great Fun etc: Wordless Wednesday: Run Dash Run! The long-awaited day dawns sunny and clear - Senior School Cross Country. In training he was the fastest in his class. They're off! Mummy is so excited she can't focus the camera. Gah. The drooping shoulders say it all. This was SUCH a moving post!! How inspiring! He is going to go so far in life with that attitude. Yes, be disappointed but smile and try harder next time. You must be one proud mama!! Beautiful! Well done - isn't it lovely as they mature (some adults still aren't at that level yet!!). Well done Dash! What a great attitude! These photos are beautiful. I think Dash and Little Man would be fast friends. Have I mentioned that he loves to run? Just yesterday he was out having me time his mile. lol. And he is obssessed with soccer. Always love stopping by. I love your inspirational posts, your fun collages, and your perspective as a photographer. And that last photos is my fav! Thanks so much for stopping by! Great shots - well done Dash! 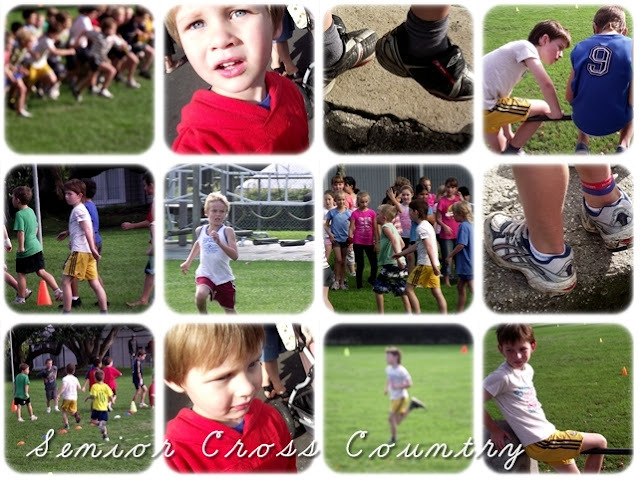 Our cross country ended in tears..... we're working on next year! Love the pics - especially love the collage up the top - and the one of Dash with his friends - total keeper! That is still a fantastic result - well done Dash, and fantastic attitude; he'll go far Simone! I love when a sequence of photos tells a story, and I especially love the collage one, could you share what program you used to create it? All of your pictures are absolutely beautiful- and the finishing touches you put on there is the icing on the cake.